Powers/Abilities: Animus feeds on anger and hatred, and can amplify these emotions in others, though it much prefers to receive than to give the gift of hatred. He can change appearances at will, taking the form of any human, male or female. Animus is apparently immune to most forms of physical harm. It can be temporarily destroyed by consuming too much hate too rapidly. History: The origins of the Animus/Hate Monger are unknown. (Avengers I#341 (fb) - BTS) - The Hate Monger hooked up with Leonard Kryzewski, convincing him to reorganize the Sons of the Serpent in order to spread hatred and violence throughout New York City. He also provided the Sons of the Serpent with advanced weaponry and costumes. (Avengers I#341) - The Hate Monger observed as the New Warriors confronted the Sons of the Serpent in Carnasie, Brooklyn, amplifying the tensions between all present and pushing them into violence. Similarly, when the Avengers showed up to try to put a halt to the conflict, the Hate Monger planned to escalate their aggressions as well. (Avengers I#342) - The Avengers fought the New Warriors while both opposed the Sons of the Serpent, all of whom were influenced by the Hate Monger. When the Sons of the Serpent fled the conflict, the Hate Monger walked away as well, allowing the heroes to regain their senses. When the Avengers ambushed the Sons of the Serpent's base, the Hate Monger physically attacked them, at which point they were joined by the New Warriors. 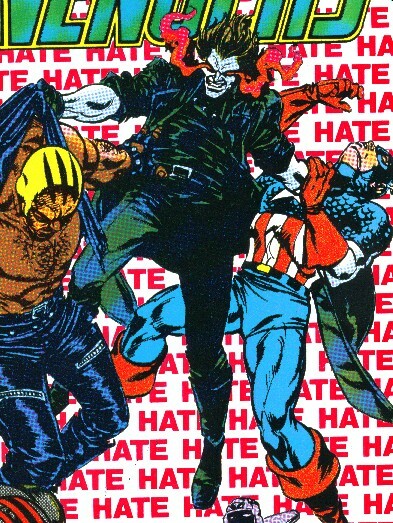 The Hate Monger crushed them all with a blast of dark emotion, but Captain America convinced Rage and the others to overcome their hatred, nullifying his attack. The Hate Monger then vanished, telling them that their resolve would soon fade and hatred would flourish within them. (Nomad II#9) - The Hate Monger first encountered Nomad during riots in Los Angeles. (Nomad II#12 - BTS) - In Fort Worth, Texas, the Hate Monger supported the homophobic ranting of the shock jock known as the Roar, who whipped his bigoted listeners into a violent frenzy. (Nomad II#13) - In Dallas, Texas, the Hate Monger watched as Nomad defeated the Needle, who had been injecting people with HIV virus. The Hate Monger was pleased when the Needle injected herself with the virus, and was amused by Nomad's comment that fear, guilt, and hate won out over hope, innocence, and love. (Nomad II#14) - The Hate Monger posed as the bodyguard of Texas Senator Hugh Greider, fighting Nomad and encouraging his violent behavior. He allowed himself to be defeated. (Nomad II#15) - Hate Monger adopted the form of Nomad in his original costume, assaulting the true Nomad and kidnapping the infant Bucky. During this time he exposed himself to the infant's force of love, which caused him great pain, which of course he enjoyed. It also showed him that he could use Nomad's love of Bucky against Nomad. Taking the form of several of Nomad's friends and foes, he attacked Nomad, but after a violent struggle, Nomad realized that he could end things by stopping fighting and refusing to hate himself. (Avengers West Coast#100/4 (fb) - BTS) - The Hate Monger supplied high-tech weapons to the War Machines, a Los Angeles gang idolizing War Machine. (Avengers West Coast#100/4) - After breaking up a gang war and observing the weapons of the War Machines, War Machine convinced Hector, an injured gang member, to tell him where he had obtained the weapons. Following his lead, War Machine encountered and defeated the Sons of the Serpent, but was then confronted and mocked by the Hate Monger. War Machine punched him to the ground and told him he'd be going to the hospital if they met again. (Marvel Comics Presents#154/2 (fb) - BTS) - The Hate Monger and the Sons of the Serpent began purchasing weapons from AIM and selling them to HYDRA, who used them to attack gangs in Los Angeles. (Marvel Comics Presents#152/2 - BTS) - After Hector was killed, War Machine confronted the War Machines to learn who had killed him. (Marvel Comics Presents#153/2 - BTS) - War Machine defeated a group of HYDRA agents and learned that they were the ones who had killed Hector. War Machine then used the War Machines to trail both HYDRA and the Sons of the Serpent, learning that AIM, too, was involved. (Marvel Comics Presents#154/2) - Under War Machine's lead, the War Machines ambushed a group of the Sons of the Serpent and stole their uniforms--though the War Machines' leader Ramon also had his gang to kill the Sons. Wearing Sons of the Serpent uniforms, the War Machines then attacked AIM and HYDRA agents, making it appear as if the Sons of the Serpent had betrayed the two groups. War Machine then contacted Baron Strucker of HYDRA and Alessandro Brannex of AIM and arranged an ambush on the Hate Monger and the Sons of the Serpent, which they then performed. (Marvel Comics Presents#155/2) - Despite the Hate Monger's explanation that War Machine had manipulated the two groups, HYDRA and AIM continued their attack on the Sons of the Serpent. The Hate Monger vanished during the confrontation, while the War Machines stole some of the ordinance, and Strucker revealed that he had known of War Machine's duplicity, but had wished to sever ties with the Hate Monger and the Sons anyway. 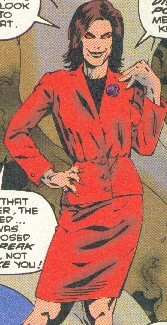 (Justice: Four Balance#1 /#2 (fb - BTS)) - Posing as Janice Inn, the assistant of Manhattan Corporate Executive Anderson Gaulthing, the Hate Monger enjoyed feeding off of his hatred. When Justice confronted Gaulthing to learn information about the disappearance of his daughter, the Hate Monger was intrigued by the self-hatred within Justice, a result of the hero killing his own abusive father. (Justice: Four Balance#2) - The Hate Monger then cast Justice and his mother, Norma Astrovik, into an illusionary world where Justice had married Firestar, had a daughter, Hilary, and was now abusing her, much the way his own father had abused him. However, when Justice's mother forgave him for having killed his father, it enabled him to get over his hatred of himself, foiling the Hate Monger's plot. (Incredible Hulk III#29 (fb) - BTS) - Hate Monger changed his name to Animus due to "trademark problems." (see comments). 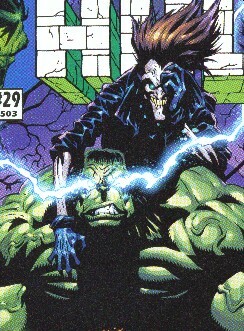 (Incredible Hulk III#29) - While Doc Samson and Dr. Angela Lipscombe worked to try to cure Bruce Banner of Lou Gehrig's disease, Animus fed on the hatred of all three of them: Bruce and the Hulk over Angela and Samson's affair and his own disease(s); Samson over being mediocre as a superhero and not being taken seriously as a psychiatrist; Angela over Bruce's having left her in college, and over Bruce's current jealousy and other complaints, etc. Animus turned them each against each other, but after he confronted them directly, Bruce convinced the Hulk personalities to give him control, and he allowed Animus to feed on his hatred. However, the extent of Bruce's hatred was apparently more than he could handle, and he was consumed by it, though as he was washed away, he did comment, "Bruce...you're so beautiful..."
However, after Bruce, Samson, and Angela had made their peace with each other, Animus reappeared, commenting, "Now for dessert..."
Comments: Animus was created by Fabian Nicieza, Steve Epting, and Tom Palmer. The Hate Monger's nature is never detailed. He seems to be an entity feeding off (and possibly composed of) hate, possibly making him a demon or an avatar of Master Hate (my choice). Per Fabian: The "trademark problems" to which Animus referred was a friendly shot at the Cap guys for having brought made up a new Hate Monger without once having referenced the new Hate Monger I'd already made up! That Hate-Monger was later revealed to be the Hitler clone Hate-Monger (see clarifications). Kind of a cool character, but it's kind of like fighting against D'Spayre. While you're reading it, you know that every single story's going to end when the hero overcomes their emotions. Except in Hulk#29, his best story. I had assumed that Proctor was the Hate Monger upon first seeing him. Not that much variation between the two from the neck up. There is no confirmation that the Hate Monger is behind-the-scenes in Nomad#12. I went with it being a continued story about hate...and the Hate Monger's proximity seemed more than coincidence. He can sense hate, and since he was in Dallas the next issue, it sure seems that he would have either sensed or perhaps participated in the violent hatred going on in those issues. Tom Brevoort says this Animus is different than the one in Blade III#4. empowered by Corporation, died when Vamp killed by Scourge, later re-created as protohusk Vamp/Animus.